Waggener Properties, LLC is your real estate specialist. Wendy Waggener is the broker of license and a multi-million dollar producer since the year 2000. Serving all of Marion, Levy, and Citrus County Florida, Waggener Properties can assist you with any of your real estate needs. 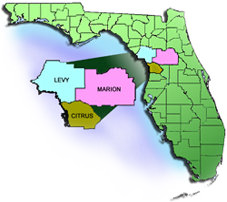 Marion, Citrus, and Levy Counties occupy this area of west central Florida known as the “Nature Coast”. It is a nature lover’s paradise. Nearly half of the land has been set aside for nature preserves, wildlife refuges, wetland sanctuaries and parks for the public to enjoy for decades to come. The area is dotted with natural springs that feed several pristine rivers and waterways. Additionally, Ocala in Marion County has evolved into the Horse Capitol of the world, thanks largely in part to its rich soil, mild climate and year round pasture grazing. Sellers, contact us today for a FREE Competitive Market Analysis to suggest the value of your property. You may not be thinking of selling now, but the information could be valuable if you are planning to build your home or reassess the insurance coverage on your property. Buyers, use this website to search all listings for sale in Citrus County and Marion County. Alternatively, you can view all homes or lots for sale by town/city. Simply click the city you are interested in Ocala, Dunnellon, Williston, Inglis/Yankeetown, or Crystal River to view all properties available now.